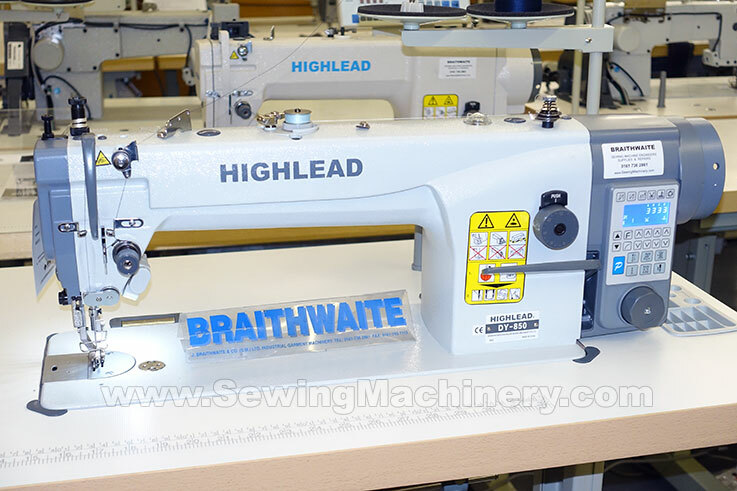 The new Highlead DY850 heavy duty industrial sewing machines with direct drive and longer arm. Featuring a walking foot top and bottom feed system that is suitable to sew medium & heavy weight materials such as leather, synthetics, canvas, plastics, webbing, upholstery, tarpaulin + heavier than normal standard fabrics. 330mm clearance from the right hand side of the needle (approximately 25-30% longer* than standard arm models) allowing additional room for stitching larger items. A large maximum stitch length is available up to 12mm for a wide range of functional and decorative stitching options. The machine is equipped with a automatic thread trimmer which is mounted under the needle plate for quick & accurate cutting of thread at the end of a sewing cycle. This saves considerable time when compared with manual cutting of threads using scissors etc. The thread trimmer is electronically controlled and uses electric impulse solenoids to move the cutting knives. A powerful direct-drive energy saving servo motor is fitted directly onto the sewing machine head and offers quicker starting and stopping, accurate positioning, low noise levels, little vibration, smooth acceleration and a greater responsiveness for the operator when compared with conventional bench mounted motors. Power consumption on the DY850 is up-to 50% lower when compared with V belt driven GC series models; offering long term energy savings. The built in operator control panel, with clear blue digital display, allows different stitch count functions. For example an operator can set a number of stitches (up to 99) and the machine will stop automatically when the set amount has been sewn. Programmable automatic back-tack stitching reduces the need to use the manual reverse lever and can save time. This function is easy to switch on or off; with the options of start and end auto back-tacking, which is user adjustable from 1 to 9 stitches. A front mounted electronic jog dial allows the operator to precisely control feeding and needle positioning for ultra slow minute rotational control of the stitching process. The maximum sewing speed is push button adjustable allowing the operator to select a suitable running speed matched to the job at hand. Lower speeds can be set for intricate operations or to allow for inexperienced operators. In addition, at higher speeds, the machines smooth acceleration control allows for a very slow start with increases in speed under your direct control. A knuckle operated reverse device; which is positioned just above the foot and allows you to reverse stitch without having to move your hands from the sewing area and a multi led "needle light" is included, which is positioned to illuminate the needle and presser foot area. The fitting of a double capacity hook & base, reduces the number of bobbin changes and helps when using the thicker threads associated with heavier materials. 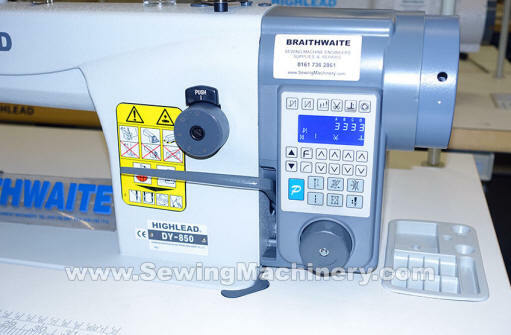 The Highlead DY-850 is a modern and feature packed walking foot industrial sewing machine for general purpose use on medium to heavy weight applications including seats, general leather articles, belts, canvas, tents, awnings, handbags, outdoor wear, camping goods, luggage and much more.